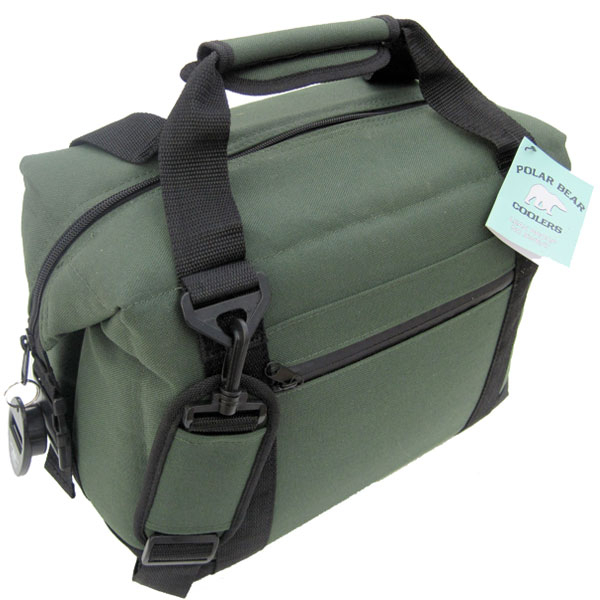 Coleman is a name you undoubtedly associate with camping and recreational gear. They’ve been in the business for over a century, producing affordable yet quality products for the outdoors. 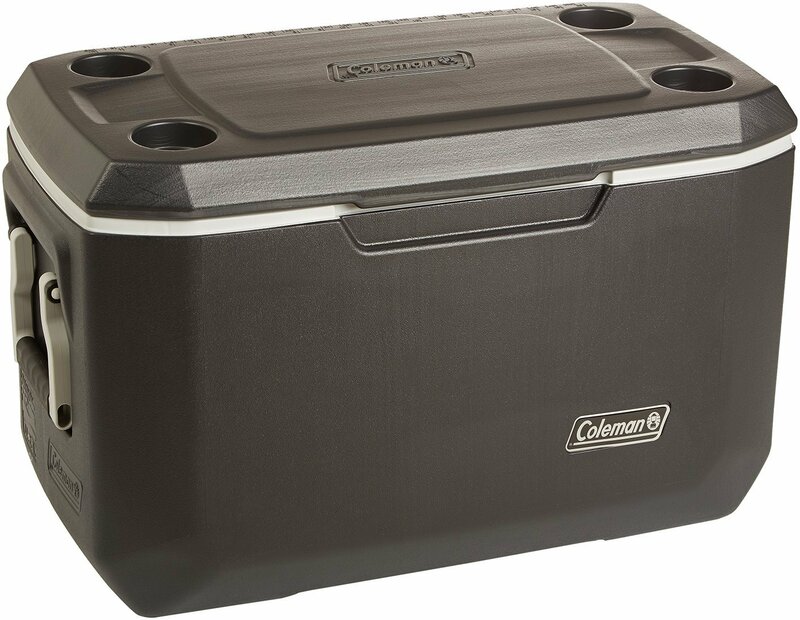 Coleman coolers are no exception. 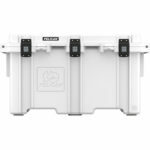 These days, there has been a massive movement in the cooler industry towards “roto-molded” coolers, with brands like YETI, RTIC and ORCA leading the charge. The problem is, roto-molding is an expensive process and these premium coolers come with a fat price tag. So despite their impressive performance, there still remains a place for affordable traditional coolers like Coleman to exist. 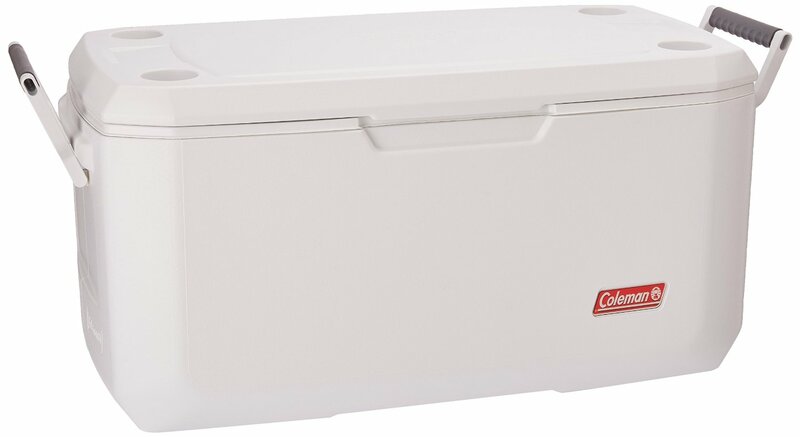 In this full review article, we outline the best Coleman ice chests you can get, see how they stack up against roto-molded models, and give our recommendations. Find out which of these Coleman coolers is going to be the best choice for you. First, we’re going to outline a few things you will want to consider and keep in mind when buying a cooler. What will you be using this cooler for most? Day trips to the beach? Weekend camping trips? Drinks and food during parties? A smaller cooler (<40 quarts) will save you money and space if you only need a cooler for the short term like day trips. 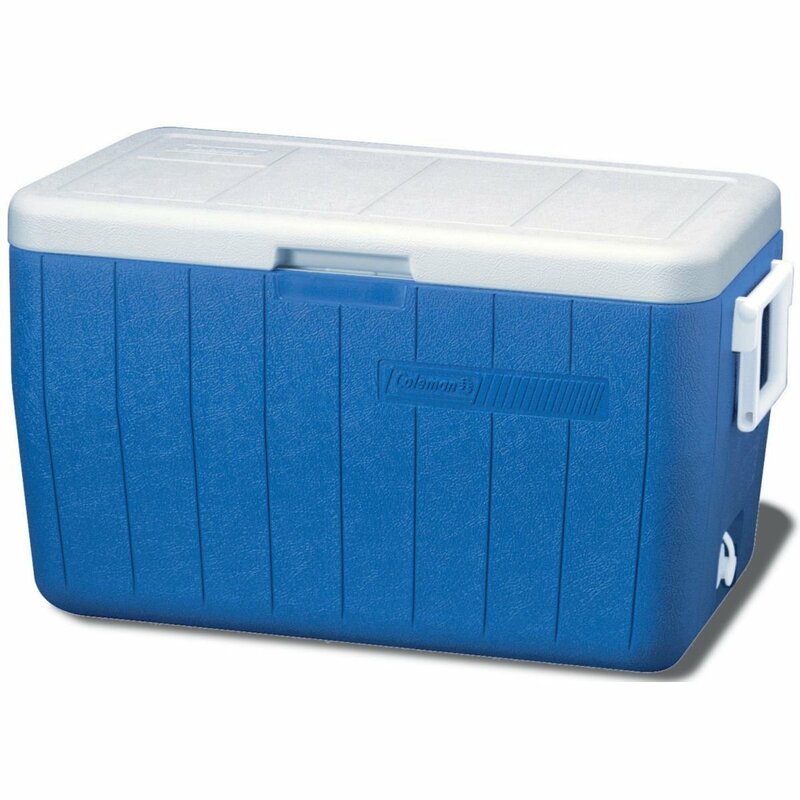 However, a larger cooler (48+ quarts) is more versatile and can have multiple uses. Not all coolers are created equal. Some do a much better job at trapping cold and keeping your ice frozen and goods cold. If you only need a cooler for day trips, then you can save the big bucks and get a cheaper model. However if you need your cooler to last a weekend or more, you may need to buy a more expensive model that keeps ice longer. Do you have the room to store a larger cooler? Who will be carrying and lugging around the cooler once it’s all filled with lunches and beverages? Maybe you should get one with wheels and save your back and knees? All things to consider! Not everyone feels the same way about how their stuff actually looks. Some (like me) are about functionality over fashion and could care less about how it looks. Others can’t stand to be seen with something they don’t deem trendy and fashionable. It’s all subjective, and just buy what you like. In general, a larger ice box and one with great ice retention will cost more, but that’s not always the case. 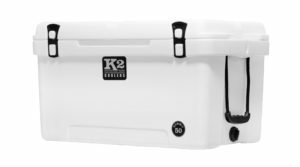 Some of these more affordable Coleman coolers can actually hold their own against YETIs and RTICs. Here are a few things to look for: Plastic hinges tend to wear out faster than metal ones. Plastic handles have the same issues, especially on larger models. Alright, let’s dive into our list of Coleman coolers! Ice Retention: Poor. This cooler is not intended for holding large quantities of ice. It’s best suited for keeping your lunch or snacks cool with an ice pack. You could fit 9 cans and fill the empty spaces with ice, but it definitely wouldn’t last you more than a day. Recommendation: This little guy is great for lunches, snacks and a few beverages. It won’t hold ice for more than a day, so don’t expect it to. But it’s a great little companion for keeping your things cool for the day. Ice Retention: Poor. This small Coleman is not intended for storing ice long-term. It will keep your beverages, snacks and lunch cold for a day, but don’t expect much longer. Good For: lunch for two, beach days, sports outings, etc. Recommendation: This small cooler is great for keeping your things cold for the day, but not much longer than that. It’s large enough to fit lunch, snacks and drinks for two, but not for a family. It’s a great day-trip cooler for a small group. Ice Retention: Average. The insulation isn’t the greatest, and the plastic isn’t the thickest, nowhere near that of a YETI. That said, your ice should stay mostly frozen and your things should stay cold for a day at the beach while in the sun. For an overnight trip you may see a lot of ice loss. Key Features: Drain spout, versatile size, lid closes tightly, available in red or blue, affordable. Negatives: Thin plastic walls, not great ice retention, hinges and handles attached weakly, no lid gasket allows heat to seep in. 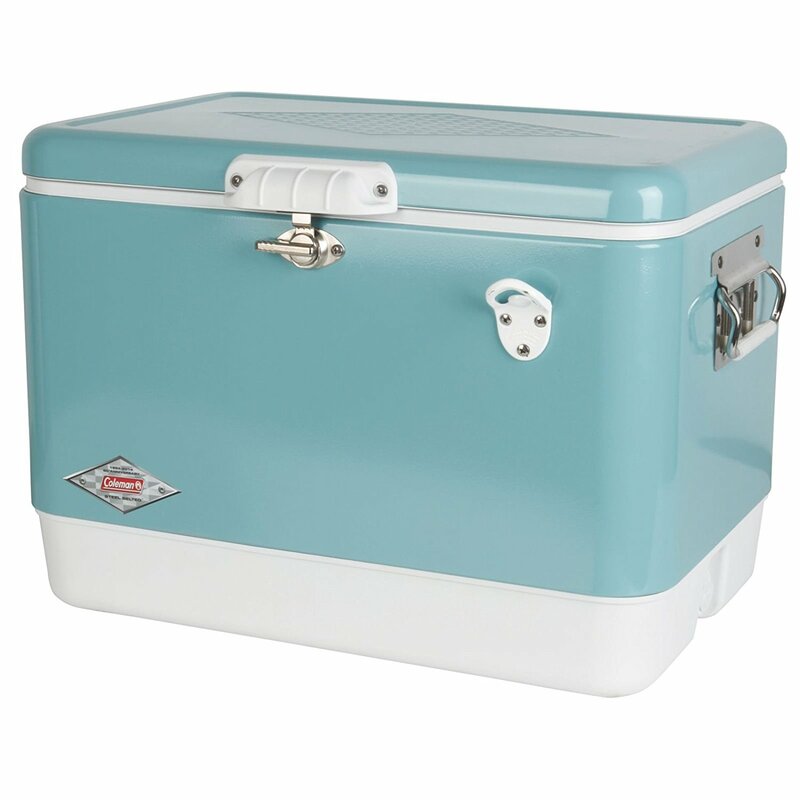 Recommendation: This is a great icebox for beach days or picnics with the family. It’s also a versatile size that can be used for drinks at parties, thawing meat and more. While you shouldn’t count on your ice staying frozen for an entire weekend, this ice chest could certainly last you overnight if you need it to, and will certainly last you the day. Plus, it’s very affordable. Size: 28 x 18 x 16 inches. 70 quarts, fits 40 lbs of ice or 100 cans. Ice Retention: Excellent. The thick insulation and plastic walls does a great job at retaining ice. Coleman claims that ice will last 5 days in the cooler and although 5 days may be a bit of a stretch depending on how often you open the lid, you can definitely get 4 days of a single bag of ice and 5 days is certainly possible under ideal conditions. Key Features: drain spout, cup holders on lid, thick plastic handles, versatile size, three colour options, lid supports 250 lbs, affordable. Good For: Weekend trips, day trips, beach days, boating, entertaining, and more. Negatives: The lid is only attached with two hinges which we could see wearing over time and becoming damaged, no rubber lid gasket to seal tightly, can be heavy when full and doesn’t have wheels for easier transportation. 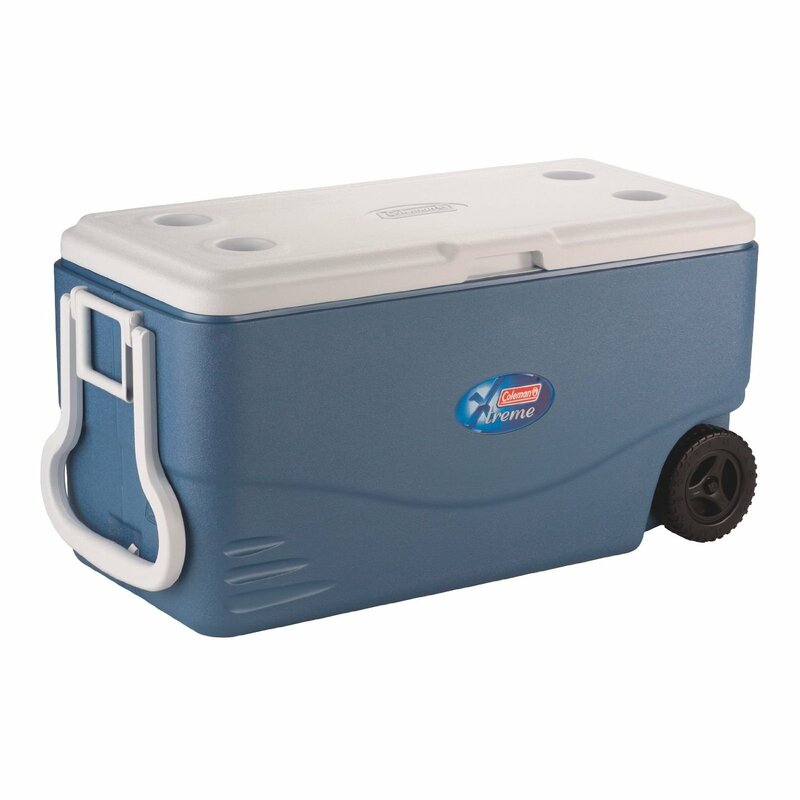 Recommendation: The Xtreme line of Coleman coolers are surprisingly impressive, especially for the price. The 70 quart size is very versatile, small enough for beach days, yet large enough for weekend trips. Ice can last up to 5 days under ideal conditions so you should no problem keeping ice for a weekend. Check out this article to learn more, where we compare the Xtreme to YETI with surprising results. Ice Retention: Excellent. The same insulation in the 70-quart Xtreme model (above) keeps ice for up to 4-5 days. Key Features: Wheels and extending handle make it easy to port around, lid supports 250lbs, cup holders on lid, versatile size, lid hinge and attachment is much better than the 70-quart model, affordable. 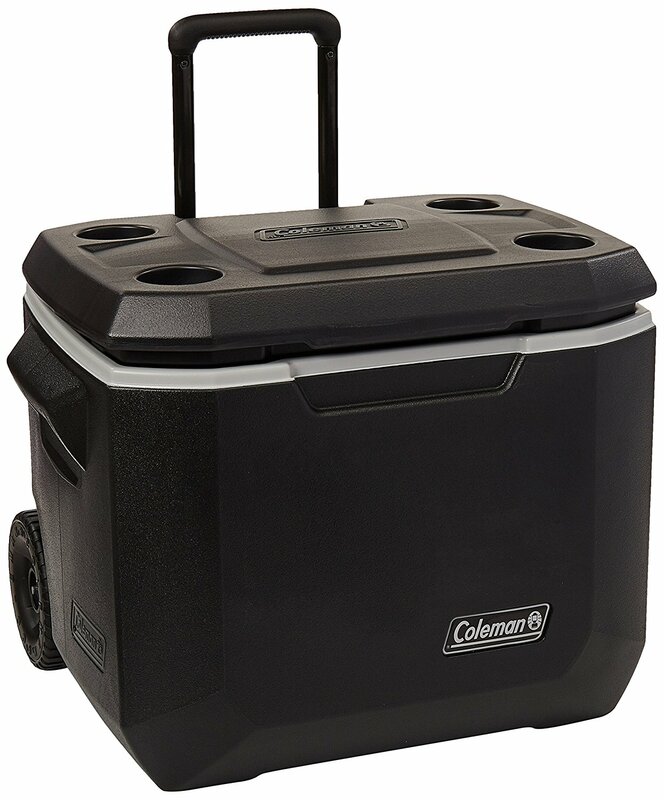 Recommendation: The 50-quart wheeled cooler from the Coleman Xtreme line is basically the regular Xtreme, with wheels and a bit smaller. You get all the great features and performance of the 70 quart model but with a little more maneuverability. Having wheels is great especially for those with bad backs or knees, or so you don’t have to worry if you can’t find closer parking to the beach! It’s a great size, and ice will definitely last you a weekend, even up to 4 days. The lid is attached firmly and shouldn’t be an issue and overall this is an awesome cooler. Size: 16 x 24 x 24 inches. Tall enough to hold 2-liter bottles upright. 85 can capacity. Key Features: The old-school style looks great, and is available in 6 additional colours, including black, red, stainless steel. The stainless steel handles and hinges are heavy-duty and won’t rip off like other plastic handles and latches, and it has a built-in bottle opener, which we love. 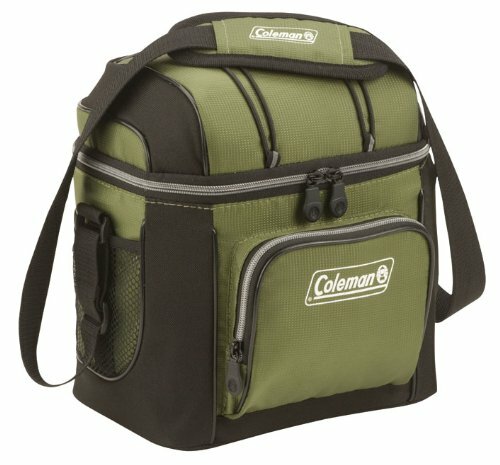 Recommendation: The Coleman steel belted cooler has a lot going for it. It looks amazing, it’s built like a tank, and has some great features like the bottle opener and stainless steel handles and latches. 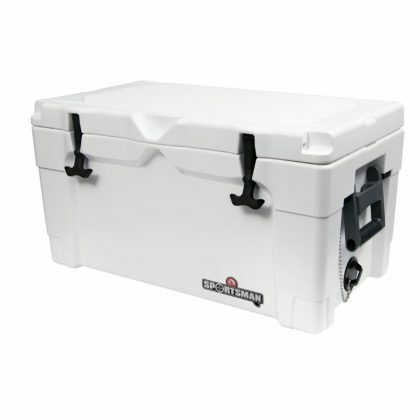 It’s a great cooler for BBQs, beach days and camping, but it won’t get up to 4 days of ice. You should get away with a weekend of ice, though. It’s also got a great 6-year limited warranty. 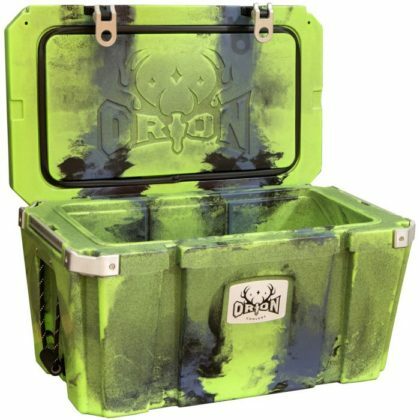 Another great cooler for the money! Size: 36 x 17 x 16 inches, 100 quarts, fits 160 cans! Ice Retention: Excellent. This is part of Coleman’s Xtreme line, and the insulation is very good. You can expect up to 4 days of ice retention, under perfect conditions possibly more! Key Features: Wheels and tow handle make it easier to port around especially when full and heavy, lid can support up to 250lbs, cup holders on lid, affordable. 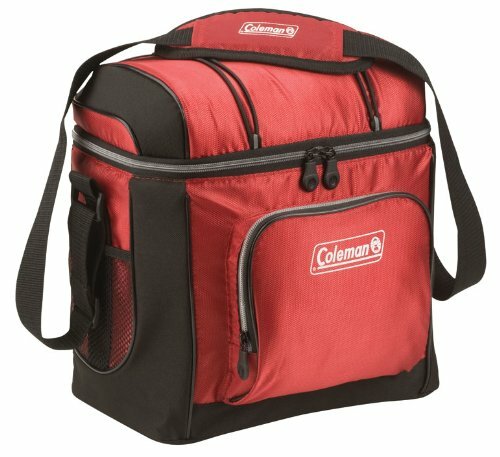 Recommendation: The Coleman 100qt wheeled cooler has a lot going for it. For one, it’s pretty dang large. 100 quarts is enough to 160 cans so even for large families, you should be able to fit everything you need in it. However, being so large does mean it’s heavy at 18lbs and even more when you’ve got ice, drinks and food in it. Thankfully, the handle and wheels make it easy to get around, but keep in mind you still have to get it in the car. 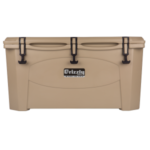 It’s an affordable cooler that is great for day trips, weekend trips or longer since the insulation is really good. Another good cooler at a great price. Size: 37 x 19 x 19 inches, 120 quarts. Holds 204 cans. Ice Retention: Excellent. Another cooler from the Xtreme, and as a result the ice retention is impressive. You can expect up to 4 days of ice retention. This won’t give you the 5-6+ day performance that you can get from an ORCA or YETI, but it’s still very impressive, at a fraction of the cost. You should have more than enough ice for a weekend, and if you’re vigilant with keeping the lid closed and adding enough ice, up to 5 days. Good For: Fishing, hunting, camping, parties, beach, storage. Recommendation: This cooler is not for the faint-hearted. It is an absolute beast with a ton of capacity so it can be overkill for some folks. 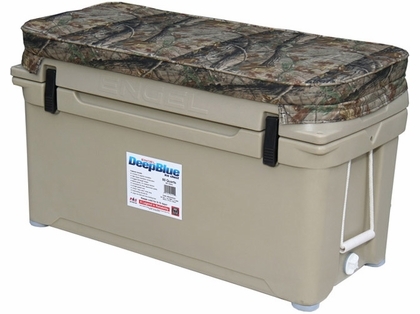 If you need a cheap, large cooler for fishing, hunting, camping or whatever else, this is a good affordable option. It won’t hold ice as well as a more expensive roto-molded cooler, but it does a great job. Such a large cooler can take time to cool down, so you will want to make sure you pre-cool the cooler whenever possible, using a “sacrificial” bag of ice. The plastic handles may be a problem when lifting the cooler while full, but the metal hinges are a great feature that won’t easily break. For such a large cooler at this price it’s a great option although it won’t be for everyone. Well, we hope this comprehensive list of Coleman coolers helped you choose one for yourself! Do you have any more questions? Comments? Or do you own one of these already? Drop us a line, we love hearing from our readers!